Arthur (Art) Rossman was born on February 7, 1909 in Greeley, Colorado, one of four children and the grandson of Volga Germans. His parents were George and Elizabeth (née Derr) Rossman who immigrated to the United States in 1903, arriving in Boston on the steamship Ultonia. In 1917, Art's father died and his mother married George Frank. In 1926, the family moved to Oregon. In 1929 George Frank, his son Herb, and stepson Art Rossman created a sanitary company serving accounts in Oswego, West Linn, Tigard, Tualatin, Sherwood, Durham, and the unincorporated areas surrounding those towns. Art started by hauling garbage in 55-gallon barrels in the back of a pickup truck. Through hard work, the humble beginnings grew into a large corporation. As growth came into the area and the business continued to expand, Art decided to concentrate on the Lake Oswego area. First known as Oswego Garbage, the company changed its name to Rossman Sanitary in 1946. Art retired from active work in 1970, but the business stayed in the family until 2000. As one of the pioneers in recycling, Rossman Sanitary Service began curbside collection of newspapers and cardboard in 1980. As recycling grew, Rossman always stayed on the cutting edge, offering new programs such as multi-material collection to the community long before regulatory requirements were in place for the region. In 1990, George and his wife Nettie sold the business to their children and over the next few years more and more programs including curbside yard debris in 1992, started to emerge. In 1991, Art Rossman donated four downtown lots between 4th and C Avenue that he purchased in 1965, demolishing the houses and preparing the land for it’s new look. 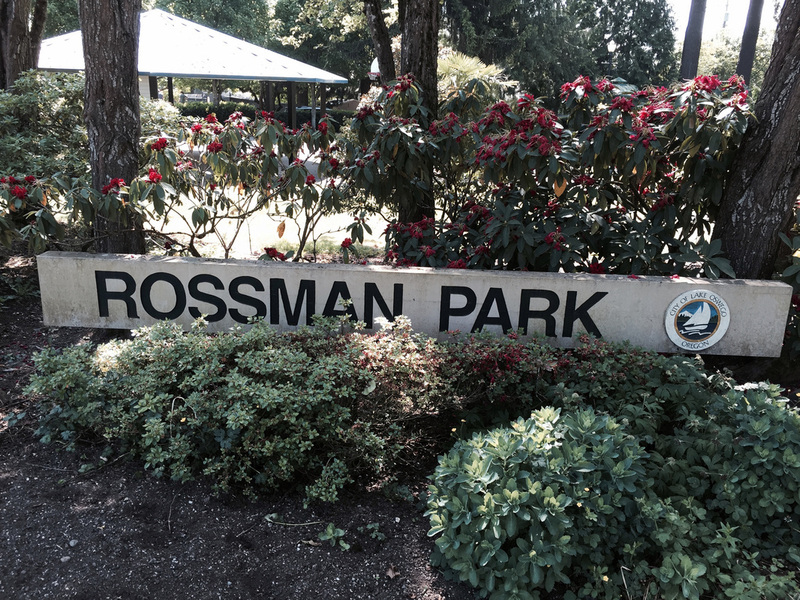 The family also donated $10,000 to develop the space that was named Rossman Park. In October 2000, the Rossman family sold the stock in the business to Allied Waste Industries, Inc.
Art Rossman was very involved in his community and supported the Lake Oswego Lions Club, Lake Oswego Elks Lodge, the Lake Oswego Chamber of Commerce and the Clackamas County Refuse Association. The Lions Club gave Art their Humanitarian Award for outstanding service to the community. Art was also a member of the American Historical Society of Germans from Russia. Entry sign at Rossman Park in Lake Oswego. Photo courtesy of Steve Schreiber. "Rossman play key role in community." Lake Oswego Review 24 Jan. 2002.